Fourtillfour is one of a new crop of coffee shops that have recently opened in Scottdale (just to the east of Phoenix), joining old hands, Cartel Coffee Lab. 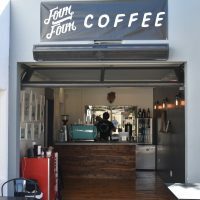 What sets Fourtillfour apart, other than its award-winning outdoor patio, is that it combines speciality coffee with the passion of the owners (Nico and Mia) for vintage cars, the couple often organising rallies and other events. I first visited Fourtillfour in February 2018, at the end of the first of two USA trips that year. 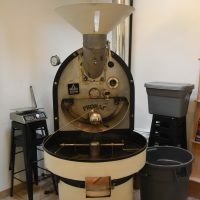 Back then it was using San Francisco’s Four Barrel, although following Four Barrel’s well-publicised troubles, Nico and Mia were in the process of choosing a new roaster. When I returned the following month, FourTillFour had switched to another Californian roaster, Verve, although that was just a stop-gap while Nico and Mia moved to their ultimate solution, roasting their own coffee, which went live in October last year.